This is my sister's wedding gift wrapped in a traditional Japanese cloth called a furoshiki. I love this way of wrapping a gift in a beautiful cloth that can be used over and over again. So eco-chic. Check out all the different ways you can use a furoshiki--from wrapping 2 wine bottles to carrying watermelons! The papers are done, the apartment is clean(er) and it's raining. Time to leave Tokyo for greener pastures. My brother just sent me these pictures and it made me even more excited to see the little ones tomorrow. I haven't seen Avery in a year, except for over Skype. Do you think she will wonder why I don't have a black frame around my face when she sees me? I crammed 3 of my 5 papers due before I leave this island on Wednesday so I could take a day trip to Kamakura and get away from the computer and apartment. It's a place I've always wanted to go and it was worth it. On the coast, just an hour away on the train, Kamakura is the old Edo capital and is beautifully relaxed and traditional. Can I live here please? A meeting room in Joochiji Temple, the first temple along a 3 km hiking course through the hills. and I love the way traditional Japanese buildings bring nature inside. This is my dream home. 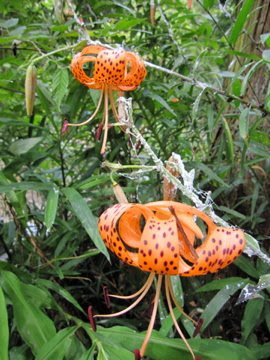 Such a cool flower. Reminds me that we live on a tropical island. Hotei, one of the Seven Lucky Gods of Japanese mythology! Hotei carries a bag on his back that never empties because he feeds the needy and the poor. Can you see how often his belly gets rubbed for luck and happiness? 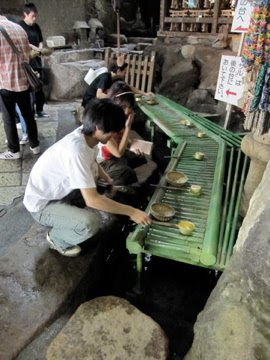 These people are washing their money in tiny baskets with fresh spring water. It is believed that if you wash your money at Zeniarai Shrine then that money will double in fortune after you spend it. Have you ever seen a lizard with an electric blue tail before? Big, big Buddha. But not the biggest in Japan. 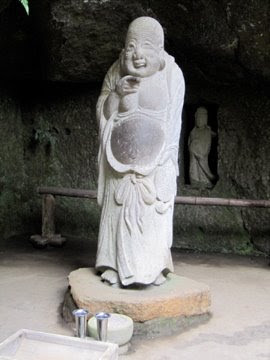 This Buddha used to be housed in a shed, but a tsunami in the late 1400's wiped away the shed. I had high hopes of enjoying some lunch on the beach, but as you can tell, I wasn't alone in that dream. When I planned to go on Monday I didn't know it was a Japanese holiday. The last time I came to the beach it was nearly empty and completely peaceful. Now that it's "beach season," makeshift bars with dance floors, 2-for-1 drink specials and loud blaring music, are set up all along the shoreline. It was a party atmosphere that I wasn't diggin' all by my lonesome. The Japanese have a funny thing about "seasons." Nothing can happen outside of the season until that specific date hits...can't go to the beach until mid July, can only climb Fuji during climbing season which ends September 1st, and just because it rains before the middle of June doesn't mean that rainy season has arrived early. It must be hard to follow so many guidelines. And of course, more food. 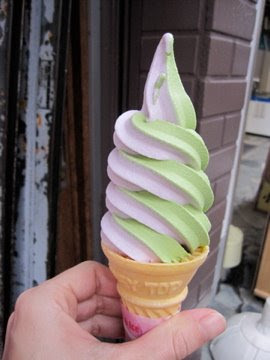 Sweet potato and green tea swirl soft serve. 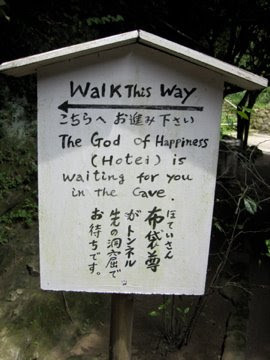 Only in Japan. I love my toilet. Yes, that's a remote control on the wall. It has many wonderful options, like men's or women's bidet choices, drying, and a heated seat for those cold mornings. It flushes automatically when you stand up. And, it is self-cleaning! Who would have thought one could have such an affinity for an object that is typically so disgusting? In the shower room, you have only to push a button to fill the tub to the correct level with the perfect temperature bathwater. And if your water gets cold, you can reheat it with another push of a button. Can you figure out which is which? Me neither. And the camera/call button fixed on the front door to the complex. When the mansion gets full there will be a man who sits in a little booth 24 hours a day to watch over the residents. I learned too late not to hit the top button--it's an emergency call button that I pushed the day I moved in. 15 minutes later a security guard came bounding up the stairs in full regalia, complete with night stick and flashlight, to make sure I was ok. Oops. Stupid gaijin. a rainbow! a full, arching, brilliant rainbow! can you believe that color? Tokyo isn't known for it's nature-scapes, but this was the most beautiful natural wonder I've seen in a long time. Yay for summer! I love food. I love cooking food, smelling food, eating food. You may already be able to tell considering most of these posts show some sort of food. Do any of us not love food? Cooking has become my creative outlet in the last few years and I like to think I'm getting better. Still working on keeping those veggies crisp in the curries, but I love trying new recipes that are healthy and a little different. After my foray into raw foods at the Spa, I thought I'd try a few things at home to keep that health stint going. I also have nothing but my computer and a few papers to distract me, so I've been playing around. tropical gazpacho with a watermelon base, red pepper, pineapple, green onion, cucumber, avocado, garlic, lime and cilantro! Delicious---too bad it looks like a bowl of dog poo when photographed! and will never. Sometimes the Japanese have the ability to completely turn you off of food. Turns out, going to Thailand to study wasn't such a bad idea. As the trip approached I honestly wasn't all that excited about the travel involved and the 10 days on my own, but it turned out to be fantastic. A teaching friend from Switzerland happened to be staying a 5 minutes walk down the beach from me for the entire week I was there. It was great to catch up, have dinner together and have someone to chat with when I had had enough of my thoughts or the ones in the textbooks. Taking 3 courses is a heavy writing load and I was glad to have the ocean to distract me from time to time. The view from the restaurant where I spent many hours working. The view from Danielle's porch. A rustic little bungalow right on the beach for only $30 a night. The restaurant and pool from my bungalow. My home for 10 days. Spa Samui is a health resort that has been around for 20 years. They offer yoga classes here (so nice to do yoga outside) and all sorts of other "alternative" health classes at the spa. Best of all, it's affordable, real and healing. I had 4 90 minute massages during my stay to work on my stressed shoulder and it really made a difference. I was about ready to buy a plane ticket for that masseuse and bring her back to Tokyo, she was that incredible. The Thai people work magic with those hands. The other "alternative" course is to do a 3 1/2 or 7 day cleansing fast. James and I wanted to do it last time, but didn't want to give up the wonderful food in the restaurant. So I vowed to do the 3 1/2 day cleanse this time. It was a great experience--no food for the whole time, but plenty of fresh juices (like this Liver Flush drink with OJ, cayenne pepper, olive oil, and ginger) and supplements to help you feel full and replace healthy nutrients in your body. It also involves a once daily colonic, but I'll spare you the details on that. I truly felt great, never hungry and absolutely refreshed. I flushed out a lot of toxins, kicked my caffeine habit (though I'm not sure I want to give up coffee), and lost 5 pounds. And the best part was that when I finished the fast I had a world class restaurant out my doorstep full of healthy Thai foods. One of the drinks I could have while fasting--young coconut juice. Delicious! I learned a little more about the raw food movement and the benefits of eating a mostly raw diet. No, it's not eating raw meat and tons of sushi, but the idea that our food is supposed to be eaten in it's most natural form because it is easier to digest and we gain the most nutrients from it. I've been experimenting a bit since I got home with raw zucchini pasta with fresh pesto and raw apple pie. You have to try it to believe how good it is. Beach from the resort looking north towards Chaweng Beach. This end is rockier and shallower. Nice for walking, but not for swimming. And the view looking south toward Lamai Beach. This end of the island is more popular with the gads of tourists because it's nice for swimming and full of big gaudy resorts and restaurants. I feel like a travel agent in this post, selling a trip to Spa Samui, but it really is a nice place. I feel so much more relaxed and zen-like coming back to Tokyo. This is the tough life of a girl taking a "study vacation" in Thailand. 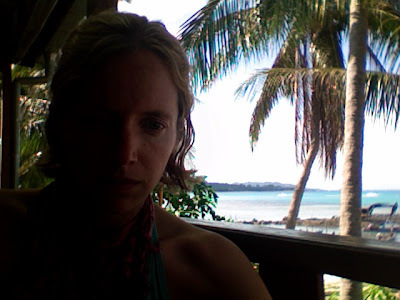 Working in my swimsuit from the balcony of the best restaurant in the country surrounded by palm trees, beaches and a view of the Gulf of Thailand.